Now available in paperback at Amazon for $7.00. Information on how to get this discount is in the book. See Ordering Information for the book below. 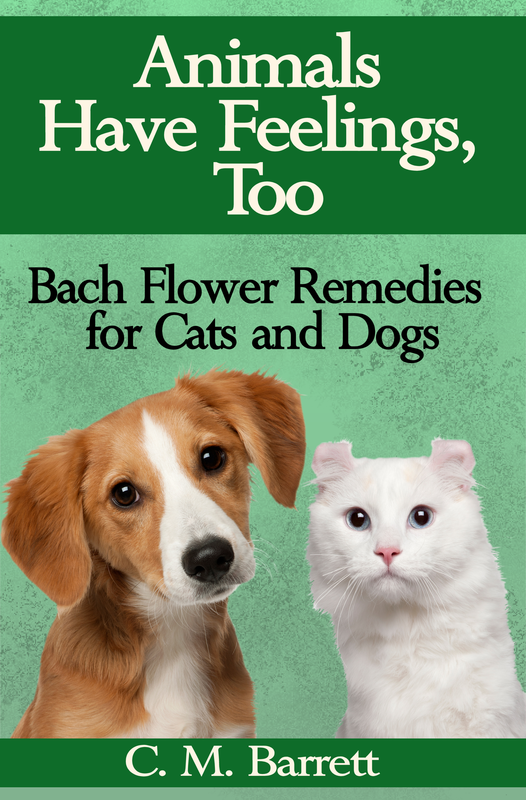 Since 1990, I've been counseling people and their pets as a Bach Flower Remedies practitioner. I'm especially committed to helping animals with the Remedies. Too many cats and dogs are returned to shelters and/or killed because of behavioral issues. I hope to make information available that can help animals' human companions apply their knowledge to treat the animals' issues. For many years I provided information about animals and Bach Flower Remedies through counseling and information on a now-closed web site. I have now moved this information to my writing site. You will find a special section on Bach Flower Remedies Here. This area provides general information for using Bach Flower Remedies for yourself and friends and family. With this book, I intend to reach more people who would like to help their animal companions and themselves. It provides descriptions of many conditions for which Bach Flower Remedies can be helpful and reviews methods of giving the Remedies. I've focused on cats and dogs in this book, but I have worked with many other species, including horses, cattle, ferrets, and hedgehogs. The principles are broadly applicable.